6-8 ounces of Super Bulky Weight Yarn. With the loom in the above position. Place peg-markers on pegs 12 and 1. I knit a sock tightly on the Knifty Knitter Loom. My gauge on this sock is 6 sts and 10 rows in 2x2 inches. With Waste Yarn of contrasting color, place Slip Knot on PEG. 1. E-wrap pegs 1 to 12. 2. E-wrap pegs 12 to 1. KO. 3. E-wrap pegs 1 to 12. KO. 4. E-wrap pegs 12 to 1. KO. Undo waste yarn slip knot from PEG. Leaving a 6 inch tail, place a Slip Knot of working yarn on PEG. Cast-on: Wrap behind peg 13 and E-wrap pegs 12 to 1. KO. 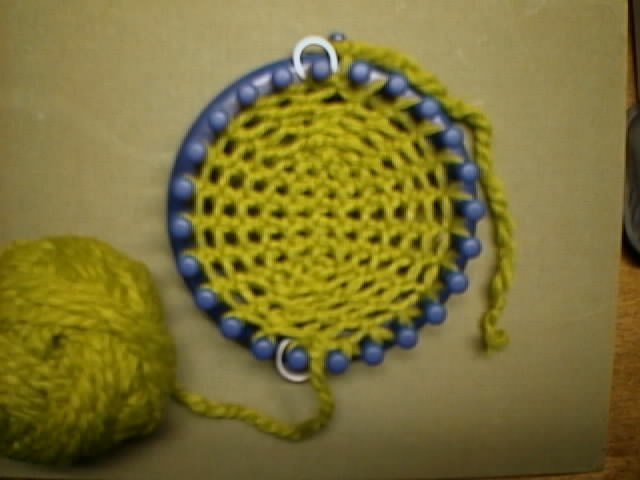 Place Stitch Marker in loop of working yarn on pegs 12 and 1. Work back and forth on pegs 1 to 12 as indicated. The working yarn should be between pegs 1 and 24. Work from right to left (counterclockwise). K12. This is the sole of the foot. K1, P2, K2, P2, K2, P2, K1. This is the top of the foot with ribbing. started on the 35th round. Your length will probably be different. Repeat the above pattern for 10 rounds above the top of the heel. remainder of the sock leg. A. Short-Row Toe: 12 rows. C. Short-Row Heel: 16 rows. 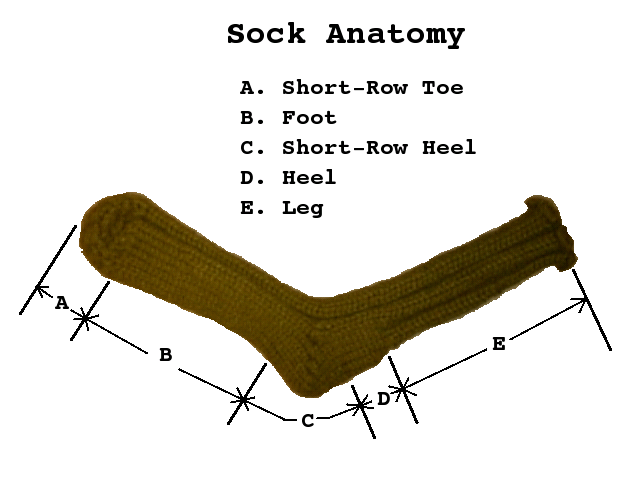 The Short-Row Toe (A. ), e-wrapped for elasticity, so the free loops can be stretched onto the empty pegs of the loom (pegs 13 to 24), is worked on half the loom (pegs 1 to 12). The Foot (B.) is knitted in the round, K12 for the sole and K1, P2, K2, P2, K2, P2, K1 for the instep, which centers the K2, P2 Ribbing pattern that will be knit on the leg. The Short-Row Heel (C.) is knit on half the loom (pegs 1 to 12) for 8 rows of Decreases, then 8 rows of Increases to make the heel turn. The Heel (D.) adds 10 rows in the round to the top of the turned heel because it not only looks better, but I think the Short-Row Heel is too short for a heel. These 10 rows follow the same pattern as the Foot. The Leg (E.) is 34 rows of K2, P2 Ribbing. However, because this sock is Toe-Up, the Leg can be made any length.